Do you have hourly workers at your company? Not keen on letting any of them go? We suggest getting a biometric time clock. There is no better way to control labor costs if you have hourly workers. 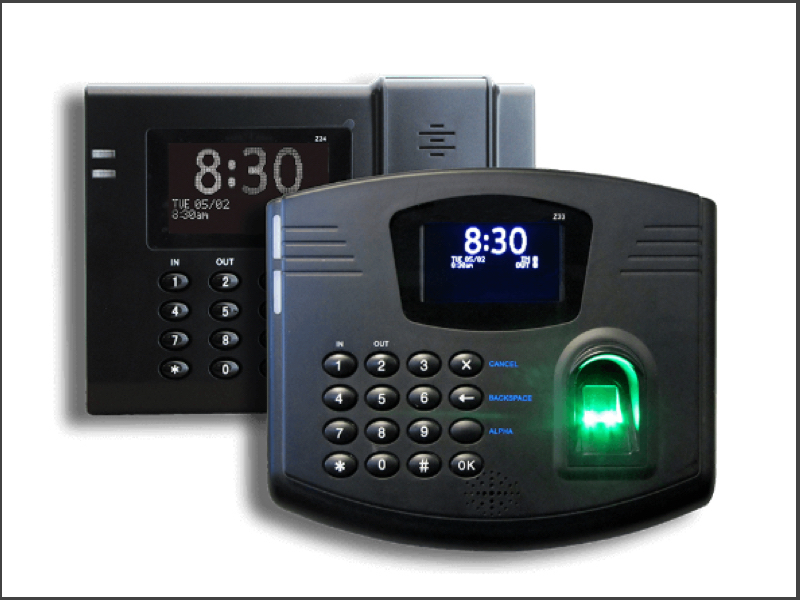 What Is A Biometric Time Clock? Biometric employee time clocks identify employees and track their work hours. Biometric clocks can sync with employee time and attendance software. Talk to Access1Source to learn how TimeSource Plus syncs with our time clocks. How Do Biometric Clocks Prevent Employee Time Theft? A biometric clock identifies each employee by their unique biological identifier. There is no practical way to cheat the system. Employers are discovering that a biometric time clock is the only effective solution for reducing time theft. With paper employee timesheets, it’s easy for an employee to add a couple of minutes before or after a shift. These minutes add up. Even a small business can lose up to four hours a week per employee. Employees also steal hours with ‘buddy clocking’ or ‘buddy punching.’ This is when an employee clocks in for an employee who isn’t at work. The ‘buddy clock’ method prevents the absent employee from receiving an attendance penalty. It also ensures that their paycheck isn’t reduced. U.S. businesses lose over $370 million a year to time theft. All types of time theft increase payroll expenses. Flagrant abusers can cost their employers thousands of dollars every year. A biometric time clock can cut your payroll expenses by 10% (or more) by preventing time theft. How Do Biometric Clocks Improve Payroll Accuracy? People also make payroll mistakes unintentionally. These include math errors on paper time cards, data entry mistakes, and lapses in memory. How many people touch each time card with a traditional system? Up to three. 1)the employee, 2)the manager, and 3)an HR or payroll staff member. Each manual step is vulnerable to human error. When a time card error isn’t caught and corrected, it triggers an inaccurate paycheck. When the employee tells the manager or HR team about the error, they have to issue another check. And fix inaccurate vacation calculations. The error could also affect overtime benefits. If a tipped employee doesn’t get paid accurately, it may affect minimum wage. In all scenarios, time card mistakes create frustration for employees, managers and administrators. How Does A Biometric Time Clock Sync With TimeSource Plus? TimeSource Plus integrates with our biometric time clocks. When you sync TimeSource Plus with a biometric clock, you gain more control. You also automate many tedious processes. The employee clocks in with the biometric clock. The clock identifies the employee and records the punch time. TimeSource Plus adds the hours worked to the employee’s digital time card. At the end of the payroll period, TimeSource Plus imports the hours into your payroll system. How Does A Biometric Time Clock Synced To TimeSource Plus Reduce Missed Punches? The clock prompt will suggest only logical choices to each employee. For example, suppose a team member is already clocked out for a meal. When he returns, the clock prompt will only present and END MEAL option. How Does A Biometric Time Clock Synced To TimeSource Plus Enforce Schedules? If an employee attempts to clock in before the scheduled shift start time, the clock will deny access. A prompt will notify her of her authorized start time. She can’t clock in until that time. Access1Source offers WorkforceHUB, the unified Human Resources portal that makes it easy to optimize the performance of your supervisors, employees, and business. WorkforceHUB includes TimeSource Plus, TimeSimplicity, and TimeWorks Mobile. We’ve just added onboarding, benefits enrollment, performance reviews, and employee engagement! WorkforceHUB is designed for busy employers like you who need to streamline scheduling, automate time and attendance tracking, maintain regulatory compliance, and lessen labor costs.